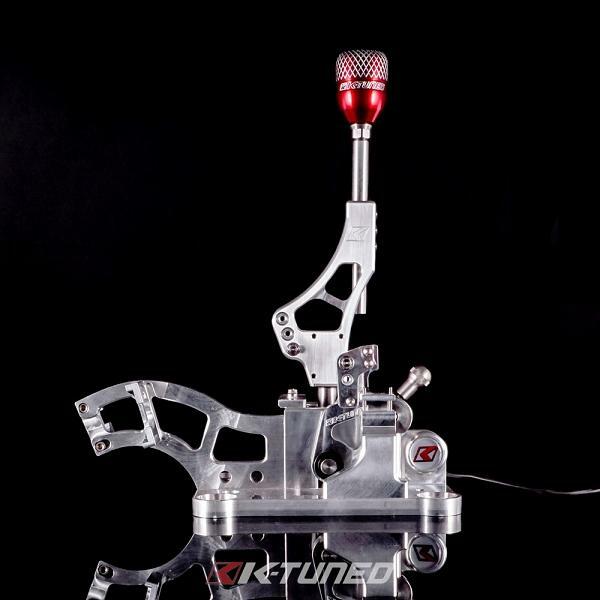 K-Tuned Shifter Solutions - Race-Spec Pro Shift Cut Billet Shifter - Lightning Motorsports - Selling Speed since 1996 ! If you take a look inside some of the fastest K-powered cars, there is a pretty good chance that you’ll find our award winning K-Tuned Billet RSX Shifter mounted on the floor beside the driver’s seat. Over the last few years, our shifters have set the bar pretty high and we have just raised it again by releasing our Race-Spec Billet RSX Shifter with a Programmable Shift Cut Sensor. This sensor is mounted on the back of the shifter and uses Hall Effect technology (just like our TPS) to accurately measure front to back shift throw and convert it into a voltage reading. The system functions very similar to a TPS sensor but instead of measuring throttle plate position it measures actual shifter positon. This information can be very useful for some race applications because the data the sensor provides can be connected to a programmable ecu input, to signal an ignition timing cut at set points during shifts. Operation is comparable to expensive strain gauge setups with one pretty big advantage; you do not have to let go of the shifter after every shift. Taking your hand off, can be very hard for some drivers to learn especially for those who have a habit of holding the shifter almost constantly. The 3 wire sensor can be supplied with any ecu voltage between 5V and 16V, so it will work on just about any ecu input circuit. When connected, the ecu will be able to read the exact shifter position and an experienced tuner will now be able to calibrate the exact positions where the ignition timing cut is engaged. For users who do not have experience creating tables and programming ecus to read signal inputs, we have developed a programmable interface unit that simplifies things quite a bit. The interface reads shifter position based on a 5V circuit, so only the 2 engagement points, activate and stop, need to be set. Using a single button on the unit, the user will be able to set the exact operating window of the shift cut signal. The output signal leaving the interface unit will essentially become the on/off switch for the ignition cut and can be set up as a positive or ground signal. The Race-Spec Billet RSX Shifter with Pro Shift Cut is currently compatible with AEM Infinity, Haltech and Motec systems which all have programmable ecu inputs. The programmable interface unit will be needed for K-Pro applications and is purchased as an add-on option. We want to note that the Pro Shift Cut is not a bolt on option for existing shifters. It is only offered as a complete shifter with the sensor already mounted in place and ready for use. The shifter comes with a set of preset shift stops, to prevent over-shifting and a centering tool for perfect setup of our adjustable K-Tuned race-spec shift cables.